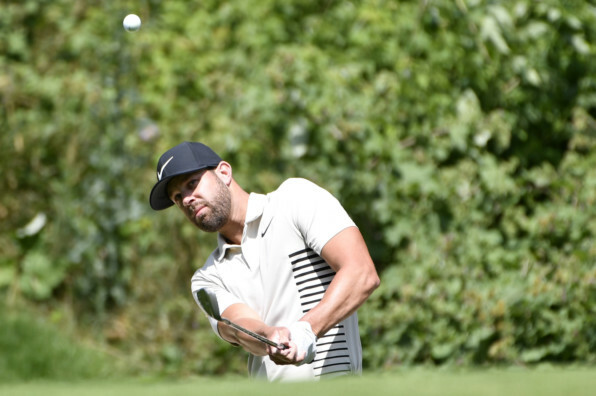 OAKVILLE, Ontario: American Kevin Tway is halfway to completing a rare PGA Tour father-son double after grabbing the second-round lead at the Canadian Open on Friday, while world No. 1 Dustin Johnson stormed into contention with an error-free six-under-par 66. Tway, whose father Bob won the event in 2003, carded eight birdies with a single bogey for a seven-under 65 at Glen Abbey, putting him top of the leader board at 13-under and a shot clear of South Korea’s Kim Whee and American Keegan Bradley. Tway said winning the same event as his father would be special. It would put them among a select few, including Al and Brent Geiberger (1976, 2004 Greensboro events) and Jay and Bill Haas (1988, 2010 Bob Hope Classics), to have achieved it. “He did it in ‘03, actually, so that was 15 years ago. It would be great to match with that,” said Tway, who is still looking for his maiden PGA Tour victory. “I talk to dad every day and he’s given me insight on this course. “We talk about every round. He can probably tell you what kind of shots I’m hitting just by like watching on TV.” Kim also enjoyed a bogey-free performance, signing for a 65, but it was Bradley who produced the round of the day firing a nine-under 63 that featured a birdie, eagle, birdie, eagle finish. “It turned kind of an average day out here into something really special,” said Bradley. “There’s not many courses you can do that on like you can out here.” Most of the names at the top of the leader board came from the early starters as winds picked up in the afternoon. But the tougher conditions did not disturb the big-hitting Johnson, who powered his way to a 66 that was highlighted by an eagle and four birdies, including one at the last. After missing his first cut of the year at the British Open, Johnson had no such concerns in Canada getting to 10-under to sit just three off the pace. “The golf course is in too good a shape not to have to go low,” said Johnson, a two-time winner on the PGA Tour this season. “Today was fairly windy but with the greens being receptive you’re going to have to attack the golf course and you’re going to have to shoot low.” Jhonattan Vegas, trying to become the first to win three consecutive Canadian Opens, looked poised to make a move until bogeys on two of his last three holes forced the Venezuelan to settle for a two-under 70, dropping him eight back of the lead. Sergio Garcia got his day off to promising start with a birdie on his opening hole but the 2017 Masters champion could not get anything going, returning a two-over 74 that had the Spaniard missing the four-under cut by a stroke. Also missing the cut were US Open champion Brooks Koepka, twice Masters and three time winner this season Bubba Watson, and Kevin Kisner, who was unable to build on the momentum from his runner-up finish at the British Open.